Let Sisson Engineering bring you our 35 years of experience working with partners around the globe to solve your manufacturing needs. When it comes to commercial and industrial manufacturing our talented team is second to none. We manage a diverse commercial product line, manufacture to tight tolerances, are accustomed to using a wide range of sizes and specifications, and utilizing materials ranging from aluminum to specialty alloys. 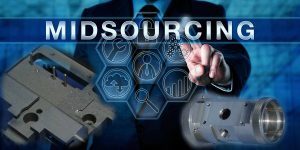 The term “Midsourcing” has become known as the technology concept for contracting a local or regional manufacturing service provider. Our team is ready to help take your company to the next level and deliver the results you expect.